... Tuesday 3 August, the MV BOW SAGA sent a distress call that she was under attack from pirates in the middle of the Gulf of Aden. An EU NAVFOR unit close by sent her helicopter to assist and stopped the attack. The Norwegian Chemical tanker MV BOW SAGA was proceeding through the transit corridor in the middle of the Gulf of Aden when it came under attack. A pirate skiff with 7 people on board shot at the bridge, damaging the windows. BOW SAGA adopted Best Management Practice and was conducting counter measures with evasive manoeuvring and the deployment of water hoses to prevent attempts to climb up onto the ship. EU NAVFOR heard her distress call and ordered the closest warship, the Spanish frigate SPS VICTORIA to react to the incident. VICTORIA already had her helicopter in the air and was able to intervene only ten minutes after the call. The pirates stopped the attack and tried to flee. 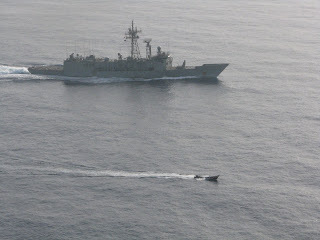 After warning shots, first from the helicopter and then from the warship VICTORIA, the pirates eventually stopped. The skiff was searched by a boarding team from VICTORIA and weapons were subsequently found. 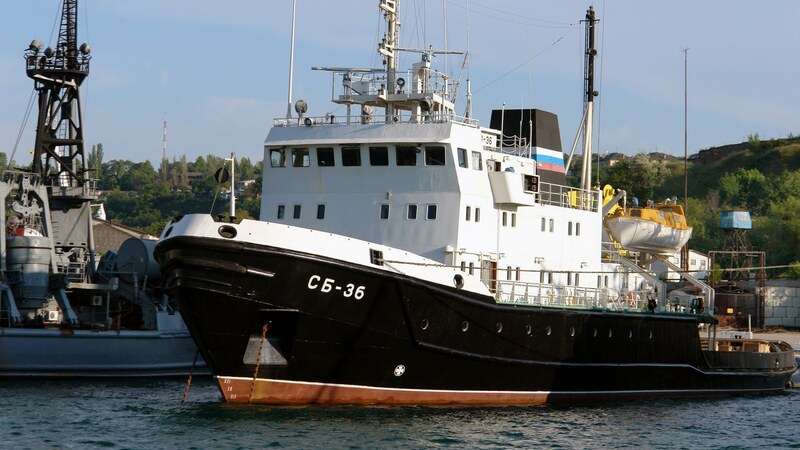 A Russian Black Sea fleet's warship repelled pirates' attempt to seize an oil tanker with 15 Russian crew members onboard, RIA Novosti news agency reported on Tuesday. The vessel SB-36, with anti-terrorism troops aboard, counter-attacked two pirate boats carrying 14 pirates. 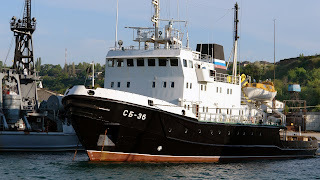 The boats were trying to approach Dafna tanker by cutting its course, a Russian Navy official told the news agency. The vessel crew opened fire at the approaching boats, forcing the pirates to withdraw. Photo of SB-36 from here. 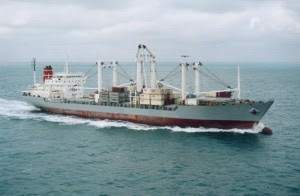 Somali pirates have hijacked the Panama-flagged MV Suez cargo ship with 23 crew on board, the European Union naval force (EUNAVFOR) has said. The ship, which is carrying a cement consignment, came under small arms fire while sailing in a recommended shipping lane in the Gulf of Aden. Its crew are from Egypt, Pakistan, Sri Lanka and India. Although they called for help, the pirates were on board by the time a naval helicopter arrived. So, now we see that a ships crew must be able to hold off pirates, terrorists by force of arms until naval forces arrive. Like the police, navies can't be everywhere at once. Armed sailors like armed citizens must be able to defend themselves while waiting for back up. For an indepth look at the Somali pirates, see the forthcoming book, Pirate State: Inside Somalia's Terrorism at Sea, available for pre-order @ Amazon.com.